Seven Dials where Philip pointed out the six sundials on the pillar! 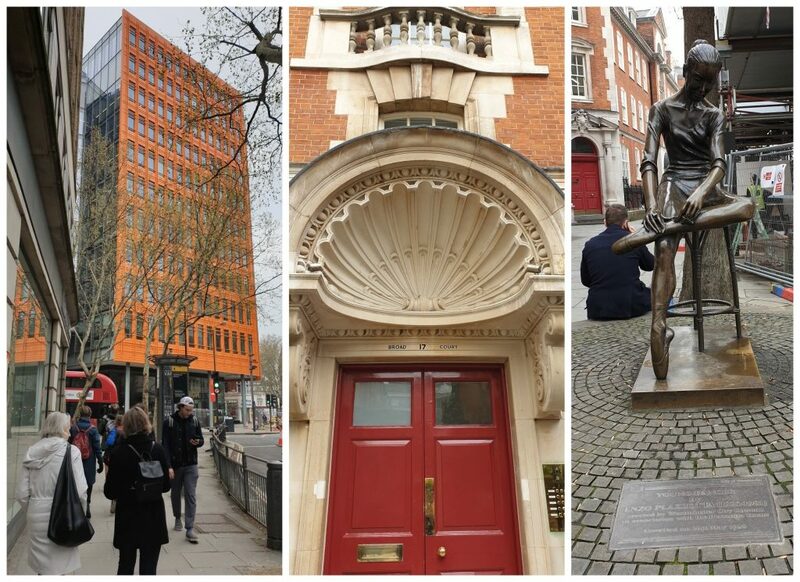 We explored the surrounding streets – Mercer Street, Conduit Court, Garrick Street, Bedford Street, Chandos Place, and Maiden Lane, each with its own point of interest, contributing to the history of this fascinating quarter of central London. Another sunny day, another walk! 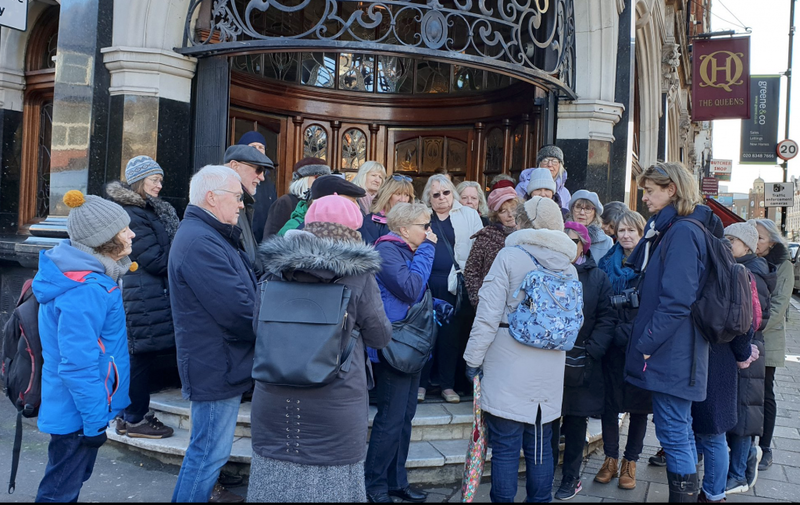 Twenty walkers met at Kew Gardens Station for the lastest of John’s curated walks around London. Many were familiar with Kew Gardens and the nearby National Archives, but fewer had probably not previouly explored the surrounding vicinity. This is indeed a prosperous area of West London, judging by the residential streets along which we walked to the first landmark, the curiously elongated church of St Anne’s (clearly the work of many hands) on Kew Green. In the churchyard was a discretely placed health and safety notice, declaring that tombstones are dangerous. We crossed Kew Green, admiring more splendid houses along the way, before crossing traffic-laden Kew Bridge, and then headed east along the river to the former fishing village of Strand-on-the-Green. The tide was particularly low, and it was difficult to understand why so many of the riverfront properties had devised their own flood defences. Leaving the riverfront we made our way to Lord Burlington’s Grade I listed Chiswick House, the jewel-in-the-crown of English Palladian architecture. This was the half-way point and fortified taking refreshment (still in the sun!) 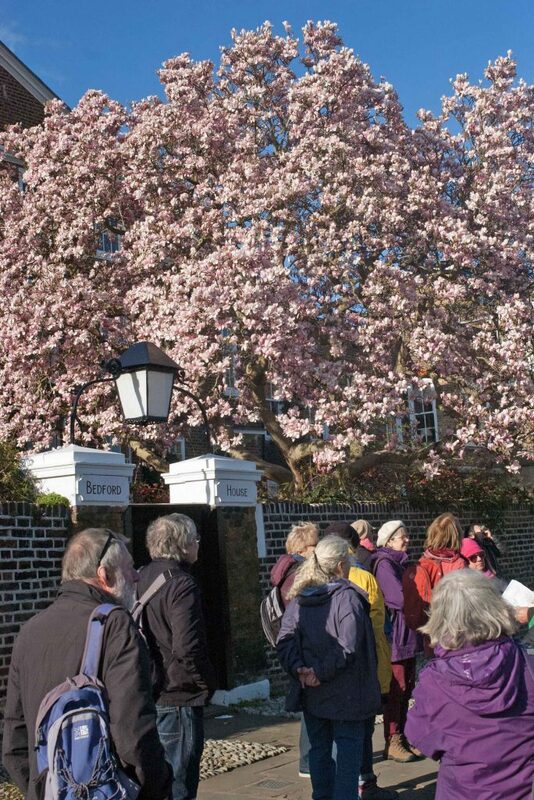 at the the Chiswick Gardens cafe we resumed our walk past the church at Old Chiswick and back to the river along Chiswick Mall, where we marvelled at a series of magnificent magnolias in full bloom. This area is full of literary and artistic associations, judging by the numerous blue heritage plaques to be seen. The walked ended at William Morris’s Kelmscott House – here the group divided. Some could not longer resist visiting one the many riverside public houses and dived into the The Dove, while the others made their way to Hammersmith for the journey home before the rush hour began in earnest. (a former gravel pit) and bird hides, and one or two of our group engaged in conversation with a couple of serious bird watchers. At Rye House we stopped for an extended lunch break in the riverside beer garden of the Rye House public house. Before we moved on we observed a bevy of swans moving gracefully along the river and a motionless lone cormorant drying his wings in the mid-day sun. After lunch the group split, some taking the train back to Tottenham Hale, while the rest of the group (some of whom made a short detour to the historic Rye House gatehouse) switched waterways and made their way along the New River to Broxbourne Station to take the train back to North London. From Barbican tube to Farringdon, taking in gorgeous churches, the remains of a medieval abbey, an ancient hospital, the eponymous well, and a meat market! 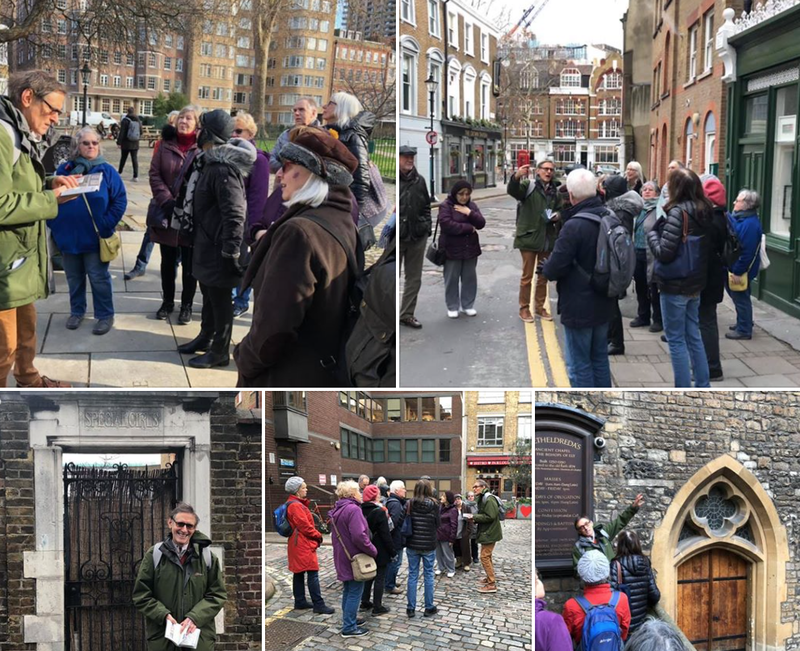 Yesterday Philip took the Shorter Walks Group on a wonderful historic tour of Clerkenwell which was like stepping into a Dickens novel & beyond. We had it all with a monastery, priory & nunnery; site where Braveheart was hung, drawn & quartered; prison known for its treadmill & harsh regime and one of the worst slums in London where drunken men & women ‘wallowed in filth’. Not for the faint hearted but we survived! Thanks Philip! Text by Alison Miller; images by Julian Osley and Alison Miller. On a freezing cold but bright day, with very blue skies, we set off from outside Hornsey Town Hall, up Crouch Hill to Cecile Park to see Kestrel House, originally Cecile House, that was the original home of Mountview Theatre School, not far from the former Hornsey School of Art. Then along to the former Park Chapel, now home to recording studios and the Mount Zion Cathedral. At Weston Park we heard about the Clock Tower erected in honour Henry Reader Williams, a local politician who did so much to preserve the green spaces from development in the area. We then sheltered on the steps of The Queens and heard of its history and saw the lovely stained glass for which it is famous. Further along Tottenham Lane we looked at the former Salvation Army Citadel, now The ArtHouse cinema and the YMCA opposite. Then to Park Road and Topsfield Road which featured in an early Madness video. We heard about Maynard (the pub and the road – now Park Road) and the history of Crouch End’s gentrification – and the coffee shop culture which started at Banners. Along the way I noted the many original cast iron street signs high on the buildings along The Broadway and Tottenham Lane as well as an interesting paving slab in Elmfield Avenue (see HHS newsletter 150 of March 2017 for the history of Aberdeen Adamant). For anyone interested in a walking history of Crouch End I would recommend Crouch End – Four Walks available from Hornsey Historical Society. Similar guides on Hornsey and Muswell Hill are also available. We had a good turnout of twenty eight members for the first of the year Short Walks from Tottenham Hale to Ponders End along the Lea.Shaking off the Christmas lethargy, we walked the river path through sometimes semi-industrial, sometimes very rural, landscapes, taking in herons, cormorants and drifting swans – scenes so tranquil that we forgot we were in London until the giant IKEA sign loomed on the horizon and we realised we were quite close to the North Circular. The Ponders End Harvester was a welcome sight at the end of this wintery walk.